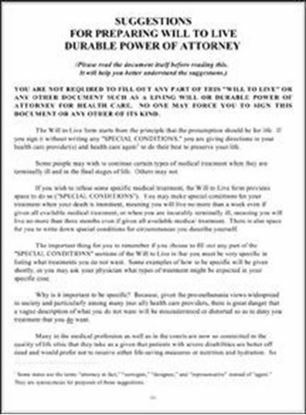 Some may ask if it is acceptable to sign a “Living Will.” Obviously, we cannot predict the future, or know in advance what form of sickness or disease we may be afflicted with in the years ahead. We do not know what treatments we will need or what will be available. The "Will to Live" is an alternative to a "Living Will." This is a safer route to appoint a health care proxy who can speak for you in those cases where you may not be able to speak for yourself. This should be a person who knows your beliefs and values, and with whom you discuss these matters in detail. In case you cannot speak for yourself, your proxy can ask all the necessary questions of your doctors and clergy, and make an assessment when all the details of your condition and medical needs are actually known. That's much safer than predicting the future. Appointing a health care proxy in a way that safeguards your right to life is easy. The "Will to Live" is different for each State. If you are ordering a "Will to Live" for someone in a different State than the address you give us, please let us know in the notes section so we can send you the correct form. The CD contains Fr. 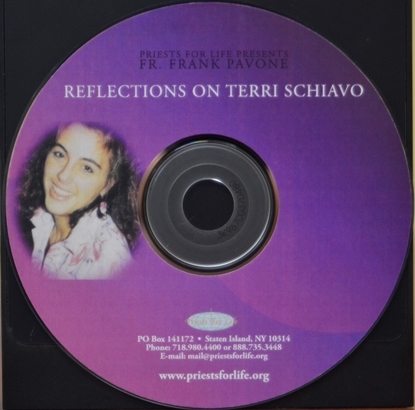 Frank Pavone's stirring "Reflections on Terri Schiavo" - a forty-minute talk. Read Fr. Frank’s eyewitness account of Terri’s final hours. This is the truth that you have not heard in news reports. Also available as an audio CD.